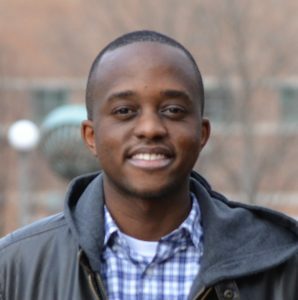 William Naggaga Lubega is a Ph.D. student in the Energy-Water-Environment Sustainability program in the Department of Civil and Environmental Engineering at the University of Illinois at Urbana-Champaign. His research explores tradeoffs between electric power grid reliability and water resource externalities under drought and heat wave conditions. Specifically, he focuses on optimal decision making in operations planning time scales under water-constrained conditions, through integration of stochastic hydrological models, power grid reliability models, and economics considerations. His work seeks to bridge the technical gap between water resource management and power grid operations, in support of integrated planning and policy development. W.N. Lubega and A.S. Stillwell. (2017). “Maintaining electric grid reliability under hydrologic drought and heat wave conditions.” Applied Energy. In press. W.N. Lubega and A.M. Farid. (2014). “A Reference System Architecture for the Energy-Water Nexus.” Systems Journal, IEEE. 10(1), 1-11. W.N. Lubega and A.M. Farid. (2014). “Quantitative engineering systems modeling and analysis of the energy-water nexus.” Applied Energy. 135(1), 142-157. W.N. Lubega, A. Santhosh, A.M. Farid, and K. Youcef-Toumi. (2014). “An Integrated Energy and Water Market for the Supply Side of the Energy-Water Nexus in the Engineered Infrastructure.” Proceedings of the 2014 ASME Power Conference. Baltimore, MD, USA. W.N. Lubega and A.M. Farid. (2014). “An Engineering Systems Sensitivity Analysis Model for Holistic Energy-Water Nexus Planning.” Proceedings of the 2014 ASME Power Conference. Baltimore, MD, USA. W.N. Lubega and A.M. Farid. (2013). “A meta-system architecture for the energy-water nexus.” Proceedings of the 8th International Conference on System of Systems Engineering (SoSE). Maui, HI, USA. W.N. Lubega, A. Santhosh, A.M. Farid, and K. Youcef-Toumi. (2013). Opportunities for Integrated Energy and Water Management in the GCC. Keynote Paper at EU-GCC Renewable Energy Policy Experts’ Workshop, Promoting EU-GCC Cooperation on Water and Power Generation. Abu Dhabi, UAE. W.N. Lubega and A.M. Farid. (2013). “An Engineering Systems Model for the Quantitative Analysis of the Energy-Water Nexus.” Proceedings of the 4th International Conference on Complex Systems Design & Management. Paris, France.